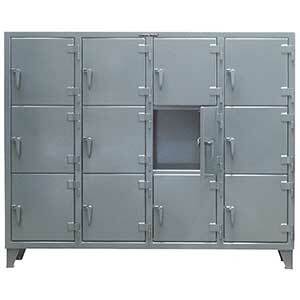 Provide quick and easy personal storage with this 82"W x 18"D x 62"H 3-tier locker cabinet. 12-gauge welded steel construction provides durability for the long haul. Each personal locker opening measures 18"W x 18"D x 18"H. Space saving, convenient and lockable.There are a total of 12 personal lockers in this cabinet. Overall height is 68". Color is Dark Gray. WARNING: This product can expose you to chemicals including Titanium Dioxide, Carbon Black, Wood Dust and Ethylbenzene which are known to the State of California to cause cancer. For more information – www.p65warnings.ca.gov.